“Authentic” Mexican rice uses something called tomato bouillon, which is basically standard chicken bouillon with added tomato flavor. I’d be shocked if such a thing exists in vegetarian form yet (I’ll check again in a few years, though), but thankfully it’s not necessary for this tasty rice dish. I use vegetable bouillon/broth/stock here. To make up for the extra color and flavor from the tomato bouillon I also added some more paprika. The classic recipe also uses a pretty large quantity of oil and when I followed one, I found it to be too greasy for my taste. I reduced the oil by more than half and found it satisfactory at that level. 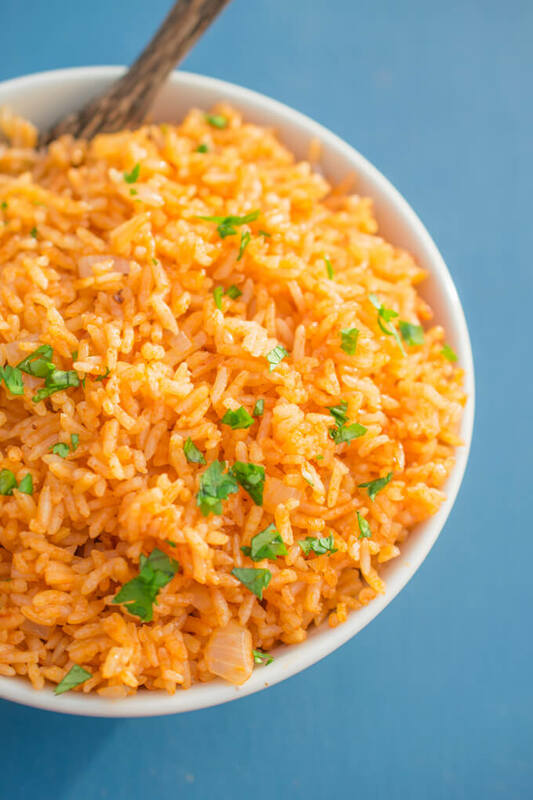 The final thing to know about this Instant Pot Mexican rice: different pressure cookers do cook rice slightly differently. For pressure cooking, a 1:1 ratio of rice to liquid is often circulated around the internet, but in my Instant Pot, if I use that quantity I end up with undercooked rice that is also burned. I always use a ratio of 1:1.25 because of this. 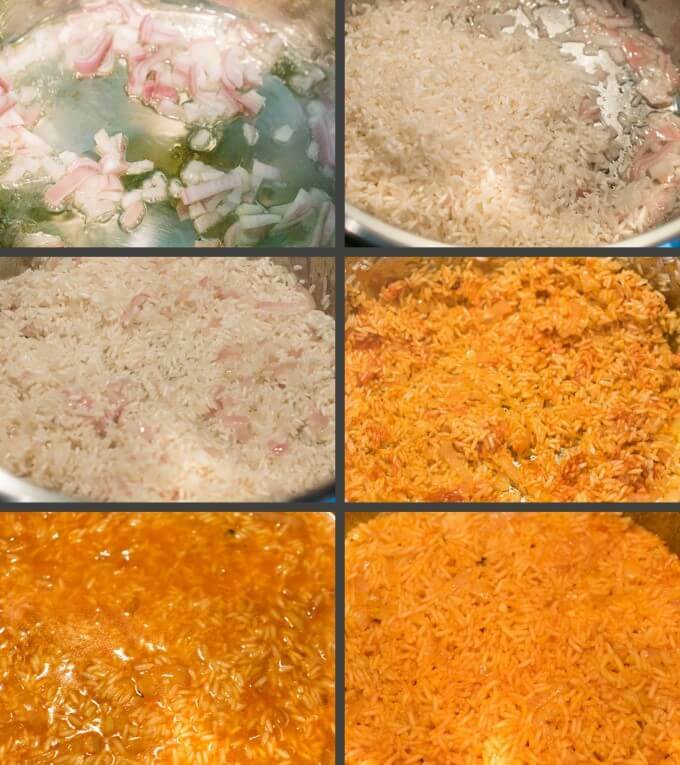 Rinsing the starch off of your rice helps make the final product fluffy and keep it from burning. The bigger your Instant Pot, the more you’ll need to pay attention to adjusting the ratio (that’s because the surface area of the rice mixture will be larger and evaporate more as the Instant Pot comes to pressure). The bottom line: there’s a chance that you’ll need to try it once and then tweak the ratio slightly for the next time. I’m only the messenger ;). The steps that happen in your Instant Pot. I’ve never tried this with brown rice so you’ll have to use your imagination there, and for folks looking to add protein, I’d recommend just pairing it with another dish, although you could add some green peas during cooking if you prefer. 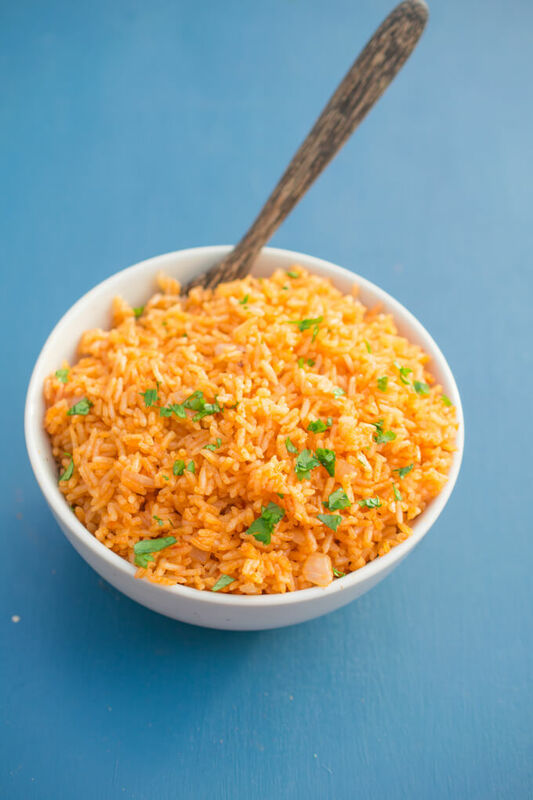 Personally I like to cozy up with a bowl of this vegan Mexican rice and some restaurant style Instant Pot black beans, and I find that to be a quite nice meal – maybe with a little bit of vegan queso added, or some crispy plantains. Enjoy! A vegetarian and vegan version of Instant Pot Mexican rice, made with simple ingredients. Great as taco or burrito filling, with beans, or on its own as a side dish. Rinse the starch off of the outside of the white rice. 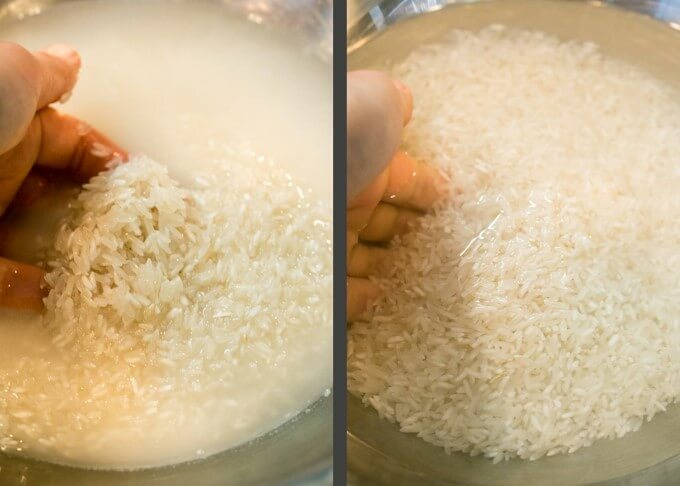 My preferred way to do this (see the photos above) is to put the rice in a bowl, submerge it in water, mix it around, pour off the excess water, and repeat until the water is relatively clear. This uses a little bit less water than simply rinsing it. Then, drain the rice. Set your Instant Pot to "Saute" mode. Once it's warm, add the vegetable oil and the onion. Cook for 1-2 minutes, stirring frequently, until the onion is fragrant. Add the rice. Continue to cook, stirring almost constantly, until the rice is toasted and just starting to stick - about 3-4 minutes. Stir in the garlic, paprika, and tomato paste, and cook for just 30 seconds more. Immediately add the vegetable broth and stir everything together, scraping the bottom well. Add the Instant Pot lid and flip the switch on the top to "Sealing". Using the "Manual" mode on "High" pressure, set the time to 4 minutes. After the pressure cooking is complete, allow the seal to naturally release (about 20 minutes). Season to taste with salt. 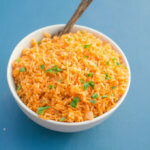 Serve the Instant Pot Mexican rice hot, fluffing gently before serving. Adapted from Tastes Better from Scratch. Yes, I’m sure it could, but you’d want to update the liquid quantity and cook time to whatever you use for brown rice. I’ve always loved this kind of rice! I’m excited to give to give this recipe a try, thank you!